. : Local music legends Jr. Gone Wild are in a dust-up with the Alberta Government over their use of a variation of the Alberta Crest as their logo. Meanwhile, a petition has been started to “Allow Jr. Gone Wild To Use Their Alberta Crest Logo!” PLEASE consider adding your name to support a great Edmonton band. Mike McDonald, leader of the band, could be fined $1,000 for using the altered version of the crest. And yet variations of the Alberta Crest have been used before, such as by the University of Alberta, and the Alberta Broomball Association. Do the right thing and sign the petition. And thank you!
. : And there it is. 60. And…end scene. Here’s a video of Sarah and I performing her song, Choosing Love. Recorded on 14 June 2013 in Edmonton.
.: Antje Duvekot is one of my favorite musicians. I love her writing, her voice, her songs. Here’s a new song on which she is currently working, called Gypsy, which Antje describes as a rough draft. Listen and love it.
.: I’ve been working with Christal Szebel, Holistic Nutritionist Extraordinaire, since last fall. She has been an inspiration, guiding me along as she creates a new eating plan for me, in an effort to lose weight, get healthier and manage high blood sugar and high blood pressure. She maintains a great recipe blog, Nutritionist in the Kitch. 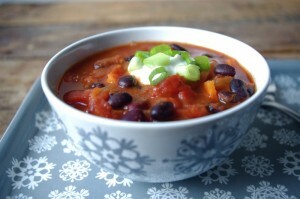 One of her delicious meatless recipes is vegetarian chili. I’ve made it a few times and it’s delicious. Check out the recipe here and give it a try! Powered by WordPress v 5.1.1. Page in 0.245 seconds.